AICN Tabletop: FREE RPG DAY IS TOMORROW! And Massawyrm shares his picks of the litter! Hola all. Massawyrm here. Well, it’s a big weekend for the RPG industry. FREE RPG DAY! And for those of you casual readers who check this column out with any frequency thinking to yourself “You know, maybe I’ll try one of these games some day” that day is tomorrow, Saturday June 21st. Free RPG Day. Much like its predecessor Free Comic Day, it is a day when the lions of the industry (and a few smaller presses) all send out free, smaller versions of their most popular lines to give folks a chance to check them out. Participating FLGS (Friendly Local Game Stores) will be giving these out (while supplies last) as well as running many of the games they receive. But it’s on a first come first serve basis, and each store will have different criteria for how they’ll give them out – so be sure to call your FLGS in order to find out when and how these will be made available. Some may be one to a customer, while others may require you to play in the demo of the game you’re getting. Others still might be throwing them at passers by just to get them out of their store. You just don’t know. What you do know (or what you will know very soon) is what they’re giving out and what’s worth grabbing. I got a stack of these last week and have been sifting through them to find the real gems. And here are the ones that particularly stand out from the pack: DUNGEONS & DRAGONS 4E: TREASURE OF TALON PASS This no doubt will be the most sought after item of the Free RPG Lot, and not just because of the popularity of D&D. Treasure of Talon Pass is a complete module, very 1st ed in feel while serving as a perfect example of how to build a 4E adventure. But what sets it apart from everything else is that it comes with goodies. The flashiest of the lot, this sports a snazzy new mini from next month’s Against The Giants release – the Lurking Wraith, a cool wraith made of blue transparent plastic – and a tile set that is compatible with their current tile sets and can be used to play the adventure on. The adventure itself is pretty standard, but cool nonetheless. It’s got the whole gamut of monsters you’d expect from a D&D adventure: kobolds, wizards, dragons, and orcs. But it also offers stats for two new creatures: a new lvl 2 Minion, the Pack Zombie, and one of my favorite playtest monsters which sadly found itself deleted for space from the MM, the Arbalester, a lvl 4 artillery Homunculus that fires crossbow bolts. There are ten encounters, so don’t expect to be able to sit down and knock this out in one sitting unless you pull a marathon session. My only complaint about the module is that it comes with a new magic item which is either poorly worded or carelessly broken. It’s a new neck item that in addition to its standard abilities, comes with a daily power that reads: Until the end of the encounter, any creature that hits you with a melee attack takes 1d6 damage. Now, if the effect ends as soon as it deals damage, that’s cool. A mighty fine magic item in addition to its other abilities. If it doesn’t however, and it is played as written, they’ve created a minion killing machine that, if placed on the parties defender, can dole out 10d6-20d6 damage in a single fight. As a 3rd lvl magic item. Yeah, just a little cautionary heads up to you DMs hoping to run this adventure. I’d run it the first way myself. But yeah, grab this module if and when you find it. It’s a keeper. HUNTER: THE VIGIL The second most anticipated game of Free RPG Day, this is an advance look at the Hunter: the Reckoning reboot for the new World of Darkness. For those unfamiliar with it, it was the game about normal humans who hunted down the evil creatures in the games Vampire: the Masquerade, Werewolf: the Apocalypse, Mage: the Ascension, etc. The problem with the original game was two fold. The first was that these NORMAL people were supernatural creatures in their own right and had a bizarre array of powers which simply made it a more violent, less political version of the other games. The second was that most players who played were absorbed with the fantastic fluff of the WoD universe, and already knew the secrets that should be kept hidden from players of a game like this. It’s kind of hard to be suspenseful when you have a player that takes one look at a crime scene and says “This must be the work of a Tremere using Thaumaturgy.” This new version, at the very least, seems to be dealing with the first problem. All of the pregenerated characters in the adventure are normal humans. No wacky powers, no divine flames of god, no crazed devout weirdness. Just people who know more than they should and are lashing out at the monsters of the night. It has a very Call of Cthulhu without being so ominous and depressing. It also introduces new creatures, and hopefully they will follow suit with new monsters that you can seed throughout your game without seasoned players being able to Scooby Doo the mystery in the first act. This game seems pretty fun, and I’m hoping to run it next week for some friends. All the rules you need to play this adventure accompany the booklet and it comes with 5 pregens – enough for 6 people to play. PATHFINDER: REVENGE OF THE KOBOLD KING Not quite yet ready for the new PATHFINDER RPG (a new modified version of D&D 3.5, already being dubbed 3.75 by fans) this is a classic module for the aforementioned D&D 3.5. It serves two purposes. 1) to introduce players to the wonderful Pathfinder series and 2) to give pathfinder fans a small module in between two of the already released modules. This is a sequel to Crown of the Kobold King but doesn’t require it to play. It’s an adventure for 4 5th lvl characters and while it is one of the most slender of the picks, it is also one of the only full color modules of the day. The art is gorgeous, everything you’ve come to expect from Paizo, so those still playing 3.5, or eager to convert modules to 4E will find a lot to like. But since it requires the rules from a now unsupported system, this one is pretty much going to be for experienced players only. TRAVELLER BOOK ZERO A throwback to the golden age of role playing games, Traveller was one of the greatest science fiction games there was. Well, Mongoose is resurrecting the old girl in fine style and offering this introductory book to get you started. As far as art is concerned, it is fairly bare bones – 4 pieces in all of 32 pages – but it is pretty dense overall. The upside to this book is that it has all the basic rules you need to play. I mean ALL of them. While not all the options are available for character creation, all of the rules are present. And it looks like if you pick up the game, this demo book serves as a handy players reference rulebook to keep on hand. The only real downside is that there is ZERO fluff explaining the universe or setting and NO ADVENTURE. This appears to be the only free RPG that is all rules and no play. If you’ve got old Traveller books or want to pick so up from a used bookstore, this could be a great way to try this out. But otherwise, I think this free release won’t do much to lure in new fans. A SONG OF ICE AND FIRE Another in the wide array of fantasy RPGs, Song of Ice and Fire earned a place on my list because it really is moving in a very different direction from the others. This game isn’t modular. It is setting driven, based upon the best-selling book series by George R.R. Martin. There’s no magic to speak of, no dragons (anymore) and the whole game revolves around political intrigue. Another 32 page booklet, this is mostly rules along with a 4 page adventure and 6 pregenerated characters. Based entirely around courtly intrigue, this is a game for folks who prefer to be in character and immerse themselves in world rather than kick doors in and put swords through kobolds. A nice change of pace for those looking for more mature role playing. HEIRS TO OLYMPIA While most of the other fantasy RPGs failed to blow my skirt up, Heirs to Olympia intrigues the living hell out of me. I’m still not certain what to make of it, but the 18 page demo book certainly has whet my appetite. Apparently the soon to be released system (put out by Countess Games) has integrated rules to play as an RPG, a miniature skirmish game AND a LARP (Live Action Role Playing game.) I’m not certain how this works just yet (the rules presented are the RPG rules) but it is a compelling concept. Especially if the rules support settings other than their standard Olympia setting. This is one to keep your eye on and maybe pick up if you find yourself as fascinated by the concept as I am. I like what they’re attempting, I’m just hoping they didn’t bite off more than they can chew. Well gang, that’s it for this week. Next week we’ve got more on Warhammer 40K 5E and maybe a few other surprises. Be sure to support your FLGS and head on over to your nearest Free RPG Day event to pick up some of the goodies. This is by no means a complete list, just those that I really enjoyed or think will play to many of you out there. There’s also a number of reprints of last years games (in case you missed it last year) so there’s sure to be a little something for everyone. But if you’re hoping for some of the prized treasures, you might want to get there early. Until next time friends, smoke ‘em if ya got ‘em. 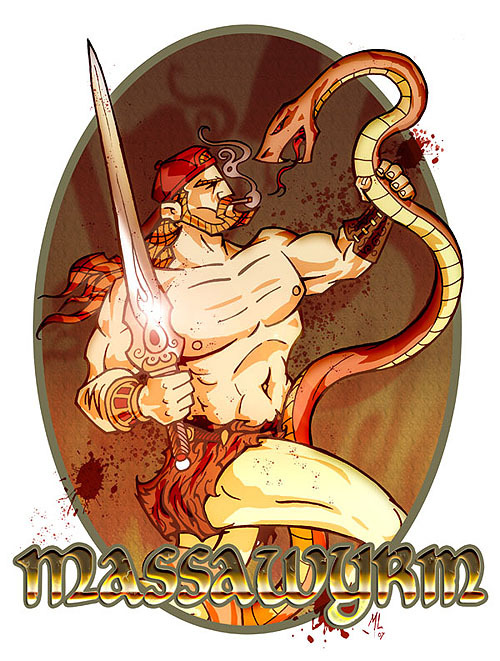 Massawyrm Got something for the Wyrm? Mail it here.